This radiation warning sign is one of many posted on the chain link fence surrounding part of the West Lake Landfill in Bridgeton, Mo. The underground fire that has been smoldering at the Bridgeton Landfill since at least December 2010 is still there. So is the World War II-era nuclear weapons waste at the adjacent West Lake Landfill. But in early September, Missouri Attorney General Chris Koster released nine reports about the landfills. One suggested the subsurface heating reaction — which people refer to as a fire — was moving north, toward the radioactive waste. Another said radiation had been detected in trees on private property outside the landfills' boundaries. Then, in early October, St. Louis County made public an emergency response plan describing how it would respond if an underground fire at Bridgeton were to reach radioactive waste at West Lake. School districts around the landfills followed up with letters to parents and staff in an effort to reassure them. But instead of providing reassurance, the newly available information has caused awareness of the landfills to spike, and along with it, misinformation, fear and confusion. Below you'll find some background information about the situation in Bridgeton and answers to critical questions about what is happening there now. Where are the West Lake and Bridgeton landfills? The Bridgeton and West Lake landfills are really part of the same complex of landfills, located in Bridgeton a couple of miles west and slightly north of the St. Louis airport. The map to the right shows the two landfills and some of their key features. Since this map was created, EPA contractors have detected more radioactive waste than what is shown in pink, including some along the southern edge of OU-1 in what is called the "muffin top" of the north quarry of the Bridgeton Landfill. The Bridgeton Landfill is outlined in black on the map. It has two distinct parts known as the “north quarry” and the “south quarry” which are separated by a narrow area known as the “neck.” The sanitary landfill stopped accepting waste on Dec. 31, 2004.
Who owns and oversees the West Lake and Bridgeton landfills? The West Lake Landfill was listed on the National Priorities List in 1990, making it a Superfund site under the regulatory authority of the U.S. Environmental Protection Agency (EPA). The landfill contains World War II-era uranium processing residues, illegally dumped there by a local contractor for the Cotter Corp., a former uranium processing company, in 1973. Under Superfund, the “potentially responsible parties” for the West Lake Landfill are General Atomics affiliate the Cotter Corp.; Republic Services subsidiaries Bridgeton Landfill LLC and Rock Road Industries LLC; and the U.S. Department of Energy. The power company Exelon Corp. owned Cotter from 1974 to 2000. When it sold the company, Exelon agreed to retain certain financial obligations relating to environmental claims arising from past Cotter actions, including those at West Lake. The Bridgeton Landfill is under the regulatory oversight of the Missouri Department of Natural Resources (MDNR). It is owned and managed by Bridgeton Landfill LLC, the subsidiary of Republic Services. How and when did the fire start at the Bridgeton Landfill? On Dec. 23, 2010, Bridgeton Landfill LLC reported to the MDNR that elevated temperatures had been detected in some gas extraction wells in the south quarry of the landfill. The facility began testing the landfill gas and found high levels of hydrogen and carbon monoxide and low levels of methane. All these conditions are indicative of a below-ground, high-temperature chemical reaction, also known as a “subsurface smoldering event” or "underground fire." At Bridgeton, underground temperatures at least as high as 300° Fahrenheit have been measured. According to Republic Services, the rate of settlement associated with the hottest part of the reaction is 2-3 feet per month. The Wilfong Family lives in Bridgeton, within smelling distance of the landfill. They're concerned about the landfill's effects on their health. Three of the Wilfong children have asthma. It is impossible to know how the subsurface fire at Bridgeton started, but the most common cause of such fires is that too much gas is drawn out of the landfill through a gas collection system. That allows oxygen to get underground, one of the conditions needed for combustion to start (see p.5 of this Thalhammer report). According to Republic Services, the reaction started in the northeast part of the Bridgeton Landfill's south quarry and has moved in a counterclockwise direction, remaining contained in the south quarry. Republic says the hottest part of the reaction, known as the "front," is now in the southeast corner of the landfill. Underground landfill fires produce potentially toxic gases, including carbon monoxide, volatile organic compounds, aldehydes, hydrogen sulfide, sulfur dioxide and benzene ― a known carcinogen. Area residents first started noticing an increase in smelly fumes from the landfill early in the spring of 2012. Since then, air sampling conducted by Republic Services and the MDNR ― as well as more frequent monitoring starting about a year later ― has occasionally detected unsafe concentrations of some compounds. The Missouri Department of Health and Senior Services recommends that when landfill odors get bad, “sensitive individuals should stay indoors as much as possible, avoid outdoor exercise, and seek medical advice for any acute symptoms.” Those symptoms could include headache, severe nausea, and fatigue. Some area residents have also reported nosebleeds, burning in the nose and throat, and aggravated asthma. Recently, questions and fears have been raised about the possibility that the underground fire could reach the radioactive waste, or that a new reaction could start there. We have more on that topic, below. How far is the fire from the radioactive waste? That question is difficult to answer because of conflicting information and uncertainty about both the extent of the underground fire and that of the radioactive waste. On this map from May 2013, the outline of the Bridgeton Landfill is shown in yellow. The underground fire is shaded in red and the closest area of radioactive waste in orange. More recent temperature and carbon monoxide measurements confirm that the fire has reached the neck of the landfill, about where the green line is on this map. Let's start with the fire. The underground fire extends throughout the south quarry of the Bridgeton Landfill. In May 2013, Republic Services estimated that at its closest point, the fire was 1,200 feet away from the radioactive waste. But that same month, Missouri Attorney General Chris Koster said it was 1,000 feet away. Carbon monoxide data collected by Republic Services in January 2014 suggested that the fire was in the south quarry and neck of the landfill, but had not reached the north quarry, the part of the landfill closest to the radioactive waste. In recent interviews, the company has maintained that the reaction is contained in the south quarry and that temperatures in the neck of the landfill have stabilized and are not increasing. State authorities disagree. In one of the reports released by Koster in September, landfill fire consultant Tony Sperling said the fire had "unequivocally" moved into the neck of the landfill, past the two lines of gas interceptor wells intended to stop its spread. But in an Oct. 15 deposition, Sperling sounded less definitive, stating that he had "not examined the information at the neck in the level of detail to determine if there is movement" of the fire toward the radioactive waste. The extent of that radioactive material is also uncertain. 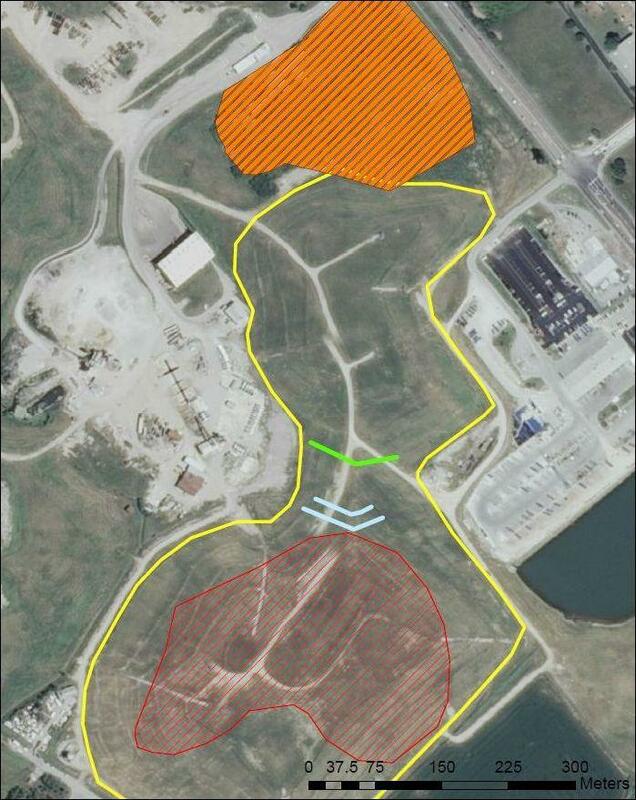 The area of radioactive waste closest to the fire was thought to be contained behind a chain-link perimeter fence in the West Lake Landfill’s Operable Unit 1 Area 1. But in March 2014, the EPA said testing had detected radioactive waste farther south than expected, about 100 feet inside the north quarry of the Bridgeton Landfill. That would put the fire about 900 feet from the waste. More recently, in May through July of this year, EPA contractors conducted additional testing and soil sampling to try to better delineate the extent of radioactive waste in the southwestern and western portions of OU-1 Area 1. According to an EPA spokesperson, that testing "extended into the north quarry 'muffin top' and ended before the former north quarry high wall," suggesting that there is at least some radioactive contamination in the north quarry of the Bridgeton Landfill along the edge of OU-1 Area 1. The EPA said it expects validated results from the soil sampling to be available in the first week of November. How quickly is the fire spreading towards the radioactive waste? That is another matter of debate. According to one report produced for the MDNR in June 2013, the underground fire was spreading north at a rate of 1-2 feet a day. That was down from an estimated rate of about 3 feet a day a few months earlier. Assuming the fire had continued at a similar rate in the north quarry, it would have taken about 1-3 years for the fire to reach the radioactive waste. That time frame assumed that the north quarry contains similar materials as the south quarry and would burn at the same rate. In March 2014, a spokesperson for Republic Services said the fire's spread had slowed to 6 inches a month. The MDNR said it could not confirm that rate, other than to say that based on physical observations of the Bridgeton Landfill and evaluation of temperature data provided by Republic, the northward movement of the subsurface fire into the narrow neck of the landfill had "slowed substantially." Last month, the same report by consultant Sperling that said the fire had spread north into the neck of the landfill also estimated that the reaction was moving in the south quarry at a rate of 150 to 300 feet a month (5-10 feet a day). The report said that if the reaction were to expand in the north quarry at the same rate, "high temperatures from the reaction could conceivably reach OU-1 in 3 to 6 months." But in his Oct. 15 deposition, Sperling said he did not know whether the fire was moving north in the neck of the landfill and agreed that any movement by the fire was occurring much more slowly than it had in the past. The EPA has said it "completely disagrees" with the conclusions of all of the reports commissioned by Koster, and that it sees no evidence that the reaction is moving toward the radioactive waste. 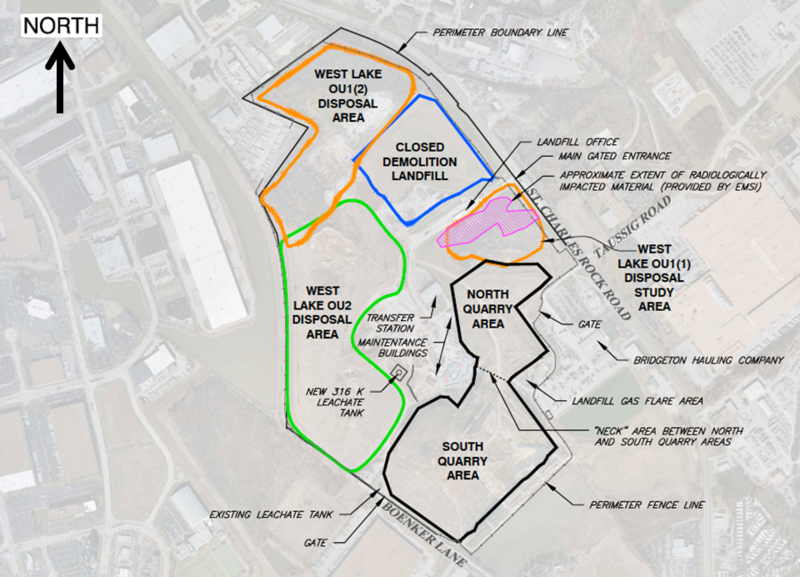 Similarly, landfill owner Republic Services has repeatedly stated that the underground reaction is contained in the south quarry and is moving south, away from the radioactive material at West Lake. What could happen if the fire were to reach the radioactive material? That also depends on whom you ask. At the request of the regional EPA office in Kansas City, EPA scientists in Cincinnati reviewed that report. According to their March 2014 analysis, if the radioactive waste is left in place and capped, a subsurface fire could crack that cap, potentially releasing radon gas, radioactive dust, and other contaminants into the air. Groundwater could also be contaminated. A landfill fire expert previously interviewed by St. Louis Public Radio said the greatest risk would be if the chemical reaction consumed a large amount of material quickly enough to cause a big hole underground. That could cause the landfill surface to cave in. Under those conditions, the smoldering reaction could break through to the surface as an actual flaming fire and spread much more quickly. Both the EPA regional office and Republic Services maintain that it is "highly unlikely" that a subsurface fire could come into contact with the radioactive waste. But some area residents, environmental groups, and local officials are convinced the threat of the fire reaching the radioactive material is real and have called for the waste’s removal. Those fears have been inadvertently heightened by the widespread publicizing of alarming-sounding excerpts from Sperling's report and St. Louis County's emergency response plan. A nuclear policy analyst has voiced more general concerns about the safety of having radioactive material at the West Lake Landfill, since it was never designed to contain nuclear waste. Why don't they put the fire out? This photo shows part of the plastic (EVOH) cap extending over the south quarry of the Bridgeton Landfill. High subsurface temperatures have been measured at depths of more than 150 feet below the ground surface, over an area of at least 15 football fields (that was in March 2013). Excavating such a large area would be difficult, if not impossible, and would likely increase toxic fumes and the risk of the fire breaking through to the surface. And since it's a chemical reaction, not a fire, pouring water on it won't work. In August 2013, Republic Services finished covering the south quarry with a plastic cap. One of the goals of putting a cap over the landfill was to keep oxygen from getting underground (see p.26 of this report). A similar cap is planned for the north quarry. In all, Republic said it has spent about $150 million to contain the reaction and its noxious odors. Ironically, those same measures are likely to prolong the reaction well-beyond the typical 2 to 7-year life-span of an underground fire. The company has said the reaction could last another 5 years before it eventually extinguishes itself. In September 2013, Republic Services committed to build a fire break in the north quarry of the Bridgeton Landfill, to keep the fire from reaching the radioactive waste, partially in response to a March 2013 lawsuit filed by Koster against Republic, alleging numerous environmental violations at the landfill. But the start of construction has been delayed as the EPA oversees more testing to determine the full extent of the radioactive contamination. Today, a spokesperson for the agency said "we expect to make a decision regarding the isolation barrier analysis by the end of this calendar year." Why can’t they just remove the radioactive waste? They could ― and that’s one of four options currently under consideration by the EPA. But moving the waste would be very costly and would have its own risks for both workers and area residents. A little background: in May 2008, the EPA issued its Record of Decision for the West Lake Landfill, saying it planned to leave the radioactive waste in place and cover the landfill with a “cap” of rock, clay and soil. In this photo from late January, workers repair a flare used to burn off gases from the Bridgeton Landfill. Following a backlash from area residents and government officials, the EPA decided to reconsider its 2008 decision and asked the West Lake Landfill’s “responsible parties” to conduct a Supplemental Feasibility Study. That study evaluated two other options for dealing with the nuclear waste: excavate it from the landfill but store it onsite protected by a liner and cap; or remove it from the landfill and store it elsewhere. Each option has its pros and cons, but in the finalized study, released at the end of 2011, there were no specific recommendations on what to do with the waste. The EPA is also considering a fourth option: removing only the radioactive "hot spots" from the landfill, and leaving the rest of the waste where it is. For more on that option, you can watch this video of EPA's Dan Gravatt speaking to the Bridgeton City Council on Sep. 19, 2012; he mentions it just after 6 min. 53 sec. The EPA currently plans to release a proposal for what to do with the radioactive waste by December 2016. After the public has the opportunity to comment on it, the agency will issue its final decision about West Lake, sometime in 2017. Has radioactive contamination spread outside the landfills? A December 2014 assessment by the U.S. Geological Survey found unhealthy levels of radium in the groundwater under and near the landfills in Bridgeton. Last week, the EPA re-emphasized that the groundwater does not pose a risk to human health because it flows away from residential areas and no one uses it for drinking water. In September, Koster's reports said radiological contamination had been detected in trees on properties adjacent to the landfills. Both Republic Services and the EPA dispute those findings. The EPA has conducted its own testing for offsite radiation, including an overflight to look for gamma radiation in May 2013, and air monitoring this year. The federal agency found no evidence that radioactive material had migrated offsite. Why do some people want the authority over the West Lake Landfill transferred from the EPA to the U.S. Army Corps of Engineers? Other than West Lake, almost all of the other legacy nuclear waste sites in the St. Louis area are being cleaned up by the U.S. Army Corps of Engineers under the Formerly Utilized Sites Remedial Action Program (FUSRAP). The one exception is Weldon Spring, whose clean-up was overseen by the U.S. Department of Energy. Some area residents have been lobbying for decades to have the Corps take over West Lake. Those people believe that the Corps will be more likely to excavate and remove the radioactive waste than the EPA will, since that is what the Corps is doing at other St. Louis sites. The fire at Bridgeton has increased the sense of urgency and renewed interest in removing the radioactive material from West Lake. In late February 2014, members of Missouri's congressional delegation sent a letter to then EPA Regional Administrator Karl Brooks, asking him to contract with the Corps to take over the clean-up at West Lake. Koster followed up with his own letter to Brooks in March 2014, urging the EPA to start building the long-awaited fire break. Brooks responded that his agency would contract with the Corps to do so but that the ultimate decision about what to do with the radioactive material at West Lake would remain with the EPA, not the Corps. In July of this year, Missouri's congressional delegation sent another letter requesting to transfer oversight of West lake from the EPA to the Army Corps — this one to the U.S. Department of Energy. The DOE denied their request. Officially transferring the authority for the site from the EPA to the Corps likely would take an act of Congress.